Drupal Commerce is one of the most amazing Drupal distributions that let’s you easily build your own ecommerce solution - powered, of course, by Drupal. Not only that you you can download it and basically works out of the box, but you can further extend it with a multitude of modules created by the Drupal [Commerce] Community. Continuing with my series of responsive theme round-ups, here are 5 beautiful Drupal commerce themes that you should definitely know about. So this is it for now. Stay tuned for some other great Drupal 7 responsive themes that come out and that - let's face it - have no question of affordability. It is too bad a great eCommerce engine like drupal commerce has such ugly themes. I have not seen a nice one yet. Compared to beautiful themes available for OpenCart and Magento etc... what Drupal Commerce has available (including these) are simply awful. Whoever starts making high quality premium themes for Drupal Commerce will be filthy rich! Thanks for sharing. Well I would definitely not agree that these themes are 'simply awful' (and I have no vested interest in them), but cannot but appreciate your honesty. It's not my place to start discussing which themes look better and not - after all, it is about taste. However, I believe it's not very nice to be so strong about how 'awful' the Commerce themes are. Especially knowing how much time and effort these good people have put in. He's correct. There are no appealing themes for Drupal. It's very limited and has a lot of errors an back end work always needing to be done. I wish I would not have listened to people about using drupal. Currently changing my sites to another platform with better template choices. Of course if Drupal from the beginning was created as a CMS for e-commerce, I'm sure that there will be more impressive designs and themes for the online shopping cart websites. But you can use Drupal for everything, not only eCommerce solutions. Pure Opencart vs CMS Opencart? It is very similar to the situation between pure blog and CMS blog: single purpose and multi-purpose solution. It is very difficult to weigh the importance of technical, functional, aesthetic, managerial performance. Allow me to put my opinion in this way: Drupal is the most all-rounded platform so far I have seen. If these were free themes I would agree with you completely. But they are charging a lot for these themes and it is all about financial interest for these theme developers, not giving back or sharing with the Drupal community. So the effort they put in is really besides the point. As a Drupal Commerce site builder, the lack of quality themes is frustrating particularly when i see such great themes for other e-commerce platforms. However, I understand your point. Let me rephrase, I wish there was more variety and higher quality themes available for Drupal Commerce and Drupal in general. Using Omega is a base theme and making it pretty yourself is easy! Who wants the same theme as the next website, that's what makes Drupal so great, bit of css and you are done. I think Omega is great...but to start from Omega to get to something like this - especially for Commerce purposes - is not just a bit of 'css and you are done'. But I get your point and also think it's not so cool to have a website that looks like all others...but then again, you can modify these themes a lot as well. A little CSS and you are done? Please tell me you are kidding. Omega (like some other themes) is a great starting point. But it is a blank slate. A professional design must be created before you can write one line of CSS. That is the problem here... Drupal templates are generally poorly designed in comparison to what is available for example Wordpress. Not kidding at all, if you are developing a small personal site then a little css is all it takes. If its a professional, then yes there will be more work involved, as it should be. I don't see how a WordPress theme will help any more here? Will the designer design according to the theme you chose/bought? i think not. You are right, Omega is a clean slate, that is what makes it awesome, and you can customize your templates so if that is "poorly designed" then that's your fault. Go buy a woo theme for a couple of dollars, and change the header and sidebar colours, your site will still have the look and feel of many others. Pretty harsh, wouldn't you say? I hope the people who critique your work are a bit more kind, particularly in public. As a purveyor of very bland and particularly ugly themes, I must say I don't think you know what you're talking about. First of all, the extreme flexibility of Drupal requires a more generic approach to design. If you want something else then you'll have to pay more than the small amount these vendors are charging. Really, what on earth makes you think people should give their themes to you for free? Do you give your work away? Do you know that many theme developers also freely contribute to other Drupal projects? In fact, the guy who runs AdaptiveThemes is behind the Drupal 8 Design Initiative. You shouldn't trash people whose work you are most likely using. This response is extreme. I am not TRASHING anybodies work so don't imply that. I am making a very obvious observation that Drupal themes in general are no where near the quality of say Wordpress themes. Is this something you would dispute? As far as hard working Drupal contributors I have nothing but the utmost respect for them. However, if I demand more quality for my money from premium themes that is my right. If it pains me that the premium Drupal themes selection is not on par with what is available for Wordpress that is my problem. This has NOTHING to do with the Drupal community at all or giving back. It is about the state of the premium theme market for Drupal. If you like the quality of Drupal themes then fine. I don't so I port Wordpress themes to Drupal and I am happy. Listen, I just made a comment on this post about premium drupal themes not be of equivalent quality to WP themes. That is all. Stop with all of these baseless accusations of disrespect for the much appreciated drupal themers that contribute to the community. If you buy a license to a premium HTML theme of course you can modify it for your own use. You can do whatever you want with it as a single end user license. If you want to port it to Drupal you would need to buy an extended license for usually around $750 on themeforest. Considering that you can sell a Drupal theme in the $80 range and the dearth of decent Drupal themes... you can make a return on that invest pretty quickly. Will you consider yo add this theme to your collection? It is the first premium Drupal theme that supports Commerce Kickstart 2 out of the box. I have been looking for a premium Drupal theme that supports Commerce Kickstart 2, bu found nothing other than Danso. Now tow years after your comment, do you know of any sophisticated theme like "porto" that supports Commerce Kickstart. It seems that no themes are getting built for Kickstart. And I heard any other Durpal Commerce theme which was not built with Kickstart in mind will break. 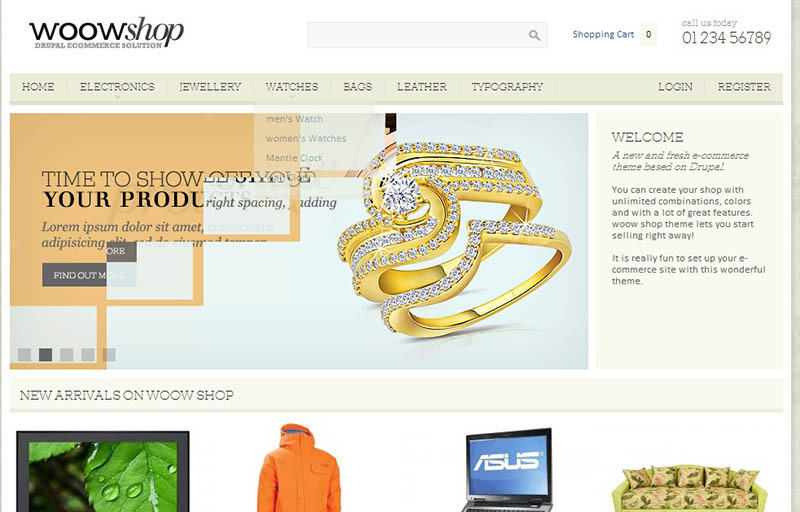 - Buidling using Drupal Commerce but with a sophisticated theme that will probably cover my need. I am building a complex store with a tight deadline. Calibrate used the Drupal Commerce module for creating this e-commerce platform together with a variety of other contributed and custom e-commerce related modules. A fully custom responsive theme was created to keep usability high on all kinds of devices while using the maximum of each visitors screen size. A very colorful style was created together with enough room on the homepage for special promotions or events. Those of you the harp on the poor state of free/paid Drupal themes have to remember that there is only so much that can be included in a Drupal theme. Many of the things that are needed to make a great looking Drupal site includes views, contrib modules and or custom modules can't be included in a theme. They can be added as a dependency or a recommendation, but it is difficult to ensure consistency, site to site. There are too many lego pieces in Drupal that can be used and customized by the developer/site builder/themer that it is not worth a themers effort to make a good looking custom theme. While constructive criticism is of benefit, if you, yourself, contribute nothing back, you are indeed part of the same problem you are going on and on about. As you stated, the so called lack of themes is generating a niche market for you. That's great. Though I do have to wonder how much of that market you are actually prospering from considering your incessant complaining. One would think you'd sit back and keep your fingers quiet so that you could continue to prosper. I apologize to all who have taken offense to my comments. Offending folks was certainly not my intent. I will not be commenting anymore on this topic as the discussion has turned into something completely different than I ever expected. Good luck to all with your Drupal projects (and themes). And thanks Danny for your insightful blog. Cheers. - Theming market in Drupal is far more under-developed comparing to Wordpress, one of the reasons is that most Drupal experts they focus on custom work which is more profitable and you can earn a lot of money in a short period of time. While usually designing a theme that could be considered as sellable - you have to invest a lot of time and effort (comparin to Wordpress). The number of professional Drupal theme providers is less than one twentieth (my estimation) of those in Wordpress. Sure you have every rights to expect (better themes) but you are in love with Drupal (as you stated) - so you gotta know its situation. - "Filthy rich" well it's contraversial but for us, no we are not making any profit yet. We are trying our best to do so but maybe there are a lot of people like you who think our products not worth your money. But I believe every single drupaler does contribute to Drupal, even using Drupal is contributing in some way. As FriendlyMachine commented, you don't know if they contribute or not until you do some research, so please don't judge that we Drupal theme providers don't contribute to Drupal. It hurts us loads. It's kinda weird for us to list all of our contribution explicitly, then it might not be 'contribution' anymore. - We appreciate your feedback about how awful TB metroz is, and personally I really wish that you could tell us more about how and what we need to improve here. Last but not least, thanks for such blogpost Danny, not only useful but also creating opportunities for open discussion. Wow, it is really cool to get a level-headed reply from the only company I feel actually develops great drupal themes. I give an admirable mention to antsin as well. What themebrain does and the effort you make in both awesome quality premium templates but also freebies to the drupal community like your nucleus theme and most recently my biggest love the tb_megamenu... set the standard for what I am talking about and got trashed in this thread. You currently produce the highest quality templates i have seen and admire your work. Unfortunately, for me there are some limitations as I am a user of the bootstrap framework and have found since your themes don't use this framework to be very difficult to work with. That is my only issue with Themebrain... but clearly, and deserving so, the best Drupal theme developers on the market. And I am a paying customer who has bought your themes. I wish you enormous success. Thanks a lot for your kind words Talengix. It's kinda inappropriate for me to discuss with you here so please drop me an email at chris@themebrain.com for any feedback. I can share with you more information about Bootstrap, Nucleus, TB Mega Menu etc. I would also like to say tb metroz is not awful. not at all. but i would not buy it. and i would be happy to provide constructive criticism outside of this thread. but believe me, i regret it came across that i think any of the mentioned themes are awful. and it was a mistake in the way i worded things which i regret now. you guys do awesome work. and it is guys like you who are finally giving drupal pretty designs. If You decide to buy & use Drupal's ... use Drupal paradigm, not other. That's the problem. You carried Non-Drupal paradign entering Drupal environment. You would be lost. In Drupal, I use only 1 .. In Drupal, I use only 1 .. yes absolutely 1 ... theme (fusion) to make unlimited style of site. I use Drupal because there is no CATEGORY/UNCATEGORIZED obligation in it. Thanks for adding WoowShop from ThemeSnap! We at ThemeSnap try really hard not to get into too many discussions about the comparisons between WordPress and Drupal -- or one framework being used within a website. Each tool has its own unique uses. And each also includes its own unique types of users. All of these users bring different skill sets and expectations to a project. And each user has a unique end result in mind when choosing their CMS, framework, or tool of choice. We like Drupal in particular because the theming engine can (and should!) be really well organized and easy to build upon. We also really like the ability to quickly extend modules or add theming functionality easily through the template engine. Related note: I have yet to see or use any other CMS with the content viewing/theming abilities of the Views module for example. Very cool module indeed! Please allow me to share my recent experience or feelings on choosing a platform for a site. Last few months, I was invited to build an academic/scholar website mainly for publishing and sharing contents. I started to examine which platform should be used. First, the project committee suggested Google, so I tried to use Project Wiki, SharePoint Online, Wikispaces, PBWorks. However, all these cannot fulfil both aesthetic and functional criteria. One of the problems is the scholar contents are dull, thin and little. I then moved my focus on WordPress, Joomla, Drupal. To meet the functional requirements, all can do well. To aesthetic, WordPress has many and many attractive templates available, but another question is should I be paid to build a WordPress site in front of the contemporary world? For this reason, I gave up WordPress. I installed over 50 Joomla and Drupal free templates on localhost. We eventually agreed to choose TB University (a Drupal CMS by ThemeBrain) or JA University (a Joomla CMS by JoomlArt). To familiar with each module, I downloaded and modified WeebPal Education for testing and training. You will wonder what I want to say so far: I love fantastic WordPress templates, but I need a well-developed CMS to manage the contents. We cannot afford an excellent graphic designer to write powerful CSS on top of the region-by-region and block-by-block CMS. The story is not yet ending ......... Another nightmare is coming. We do not appreciate supermarket-like or shopping-rack-like website. We come to an agreement that it should be a different shopping experience and product display in the e-shop. I try to look at CMS-type eCommerce. Furnito template by TemplateMonster and Wedding template by BigWebmaster are the pioneer experimental sites. I am now going to modify as less as possible so the nightmare goes to the end as early as possible. To my sharing above, let me further say: How to choose or develop a site look like? It is an analogy between where should we dine out in a restaurant or food court? It is a total dualism. Whatever the platform we use, should we build a boutique or supermarket by any eCommerce solution? One of the possible answer may be creating a department store which seems place the market position in the middle. I would like to refer Hermes (http://usa.hermes.com) as an example of Magento eCommerce. It should reflect what I would like to pursue the goal. Like an outstanding architect, Drupal, leads a team of structural engineers, interior designers, decoration contractors, material suppliers, furniture installers ........ to do everything for your dream house. However, the critical problem of a project so far I have experienced is not relating to the architect or team members, is the quality and quantity of employer (i.e. user) contents. Drupal have already done a lot of stunning jobs, leave the users take care of the works what they are obligated. dude, you are going on and on. what are you talking about? and why here? this was a discussion about themes. glad you love drupal... so do we all. but your posts have nothing to do with why drupal themes are good or bad. Wow! I feel like driving a Panamera. 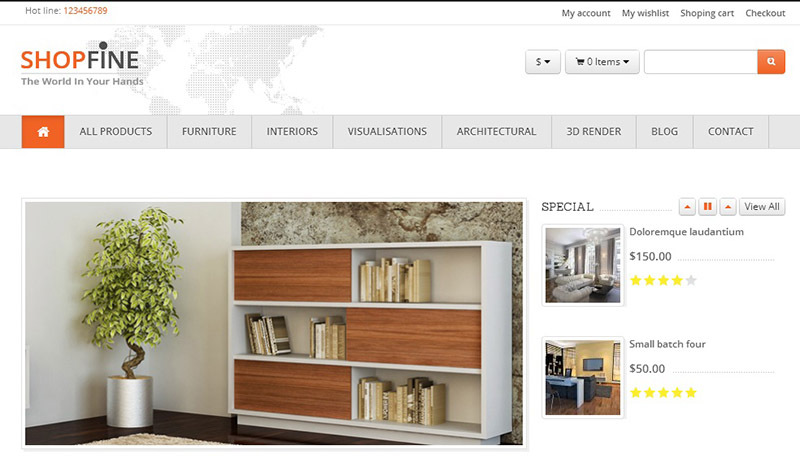 I have just installed a Drupal Commerce, and modified a ready-made template with samples. It becomes a sophisticated, stylish, content-rich-enabled e-commerce solution. A demerit for inadequacy is the availability of the modules currently available to support full functions of e-commerce and ERP. Pity! Can't catch up with a high-calibre CMS. I ain't going to prepare a K-12 composition to discuss how they are good or bad. Can you please tell me what did you use? Which theme/template? 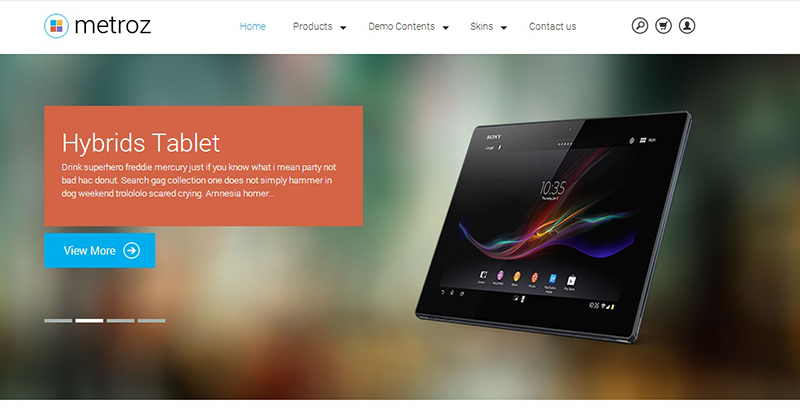 It is HTML5 & CSS3 Bootstrap Based and also Retina and Responsive. Hope you like it all and it contributes to show Drupal capabilities in e-commerce. Just wanted to add it to your great list! Thanks for the examples, even if I do not consider them so great. I would consider great examples the following ones: Acquia Prosper, AT-Commerce, Storefront, Metropolis and Velvet Sky. Hot themes ,in my opinion the theme number 5 is so cute :D .
Drupal is perfect for Commerce. It is really nice. Nice Themes, I like it. Thanks for sharing info. I am not that experienced but these themes are great. There may be other packages that may have better but then if we don't like these let us make suggestions to improve. Just to say that there are bad is just being negative without a goal.